VALLEY, Virgin Gorda, VI- Attempting to cast blame on Governor Augustus J. U. Jaspert for not putting a system in place to prevent price gouging following Hurricane Irma, residents of Virgin Gorda would have none of it and blasted their representative Dr The Honourable Hubert O’Neal (R9) and the National Democratic Party Government, saying they do not have the political will to put consumer protection legislation in place. Meeting with residents of Virgin Gorda at the Catholic Community Centre last evening, October 25, 2017, Dr O’Neal had his hands full with residents who didn’t wish to hear what they already knew but were seeking answers and solutions to their plight following the devastation by Hurricane Irma on September 6, 2017. Of the many issues that came up was that of price gouging and residents were upset that Government has made no firm effort to protect consumers apart from asking businesses not to take advantage of consumers in their desperate situation. The reality on the ground is that many businesses are not complying. According to one resident at the meeting, if there was never a system in place for price control this is the time, as according to her, despite duty being taken off certain goods coming into the territory, the consumers are not benefitting from it. Her comment drew a loud round of applause. “Well make a law,” a woman responded. “You are the government, get it in place, you are the Government,” a man joined in. “The legislation is already written, it is already written, they don’t have the will,” one person was heard saying. “Don’t tell me that,” a man stated, noting that the state of emergency has long been lifted. Dr O’Neal then continued to try to calm the situation as residents were not prepared to hear such excuses. “With no legislation in place we realise there are some inadequacies…If there is no legislation in place we cannot demand that they sell certain items at a particular price. We are basically asking them in a very nice polite way to not raise their prices, and not taking advantage of the situation as it is now. She further said the National Democratic Party and Dr O’Neal had consumer protection as one of their biggest campaign discussions, and it was them who had said the documents for consumer protection have been written. Meanwhile, Opposition Leader Honourable Andrew A. Fahie (R1) has sympathised with the residents of Virgin Gorda, saying Government should have fast tracked consumer protection legislation just as it did for the Curfew Act 2017. "We have been told for quite a while now that the legislation for price control is being drafted but timing is everything. If it is being drafted like we are continuously being told then the need to have had it fast track was now. This would have taken care of a all concerns of price gouging after Hurricane Irma. This was just as important or even more important than the curfew law that was passed seeing that the Virgin Islands Constitution somewhat already addresses the matter of curfew," Hon Fahie told this news site. 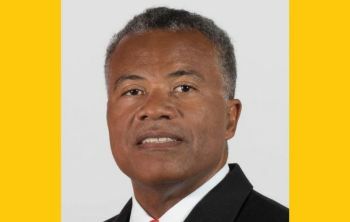 Residents also blasted Dr O’Neal and the At Large Representatives for being scarce in the Ninth District, including in Anegada following Hurricane Irma. “I heard nothing of substance from Mr. Out of Touch today. You don't represent us, and you need not come over here trying to hold any more meetings without the at large members being present. They were voted into power by us too, and we haven't seen their presence anywhere in our district to answer the questions of the people. We have been doing this ourselves and will continue to do this ourselves with or without the help of the so called government,” a Pop Stevens posted on his Facebook page last night, October 25, 2017. 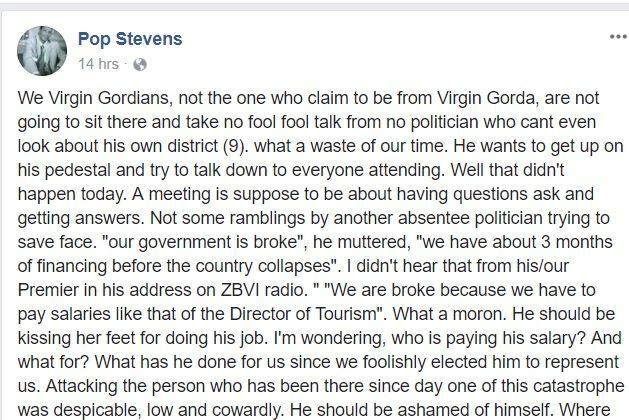 Mr Stevens said Virgin Gordians are not going to sit and take no “fool fool talk” from someone who can’t look out for his own district. “What a waste of our time. He wants to get up on his pedestal and try to talk down to everyone attending. Well that didn't happen today. A meeting is supposed to be about having questions ask and getting answers. Not some ramblings by another absentee politician trying to save face,” Mr Stevens wrote. I wonder if Delores Christopher related to he buddy, we ain't see she AT ALL, much less meetings. But when she was campaigning she was prominent, all up by Billy's, etc, Horsepath ain't see or hear her, DISGUSTING BEHAVIOR! Shame on you. The NDP old brah wearing off. IRMA must have blown it away. We need a collision government. Ronnie as Premier Tourism and Finance...Fahie Deputy Labour and Natural Resources... Marlon Penn...Minister of Trade and Agriculture.... Myron Walwyn Minister of Health Social development and inviroment.. A New Face (Preferable a Lady in Education) As Minister of education and Culture... Mitch Turnbull. Junior Miniater in Tourism and Finance ..Alvera Caines Junior Minister in Education and Agriculture... NDP we will regroup and Fix this country, we have to leave some people behind.. Country first..
You full of it. Dumb Albert as what? What you just mentioned there would be a man made disaster. The NDP is made up of the main capitalists in the territory (disguised as the Investment Club), you expect them to not profit handsomely? Get real! The The NDP members of the Investment Club are ONLY interested in cashing cheques, NOT writing cheques! my say...after any natural disaster there would be social issues that need to be adressed.In the territory there are landlord and tenant issues arising....no such Act in place.There are price gouging....no consumer protection Act in place....there are employer and employee issues .... there is a labour code in place but many workers are being sent home without severance pay or under the guise of a long vacation.....but a curfew Act is rushed and has no legal effect. This is how ALL residents of the BVI should be with the people WE voted in to lead this country. Proud of VG and hope other districts follow. Sick and tired of the excuses and the government sugar coating things like we are to stupid to understand and not see what is really going on! Keep it up though, there time going to come. This government has failed the people of the BVI big time. It's time to hold them accountable and now is the perfect time. Big ups to the people of Virgin Gorda for standing together. Where is the National Recovery Plan?!! We deserve better! Our ancestors deserve better!!! Lord I miss Hon H.L. Stoutt. I saw this guy in vg post maria and erma in full jacket and tie and i thought to myself how inappropriate this is ,given the fact that vg was totally devastated . Yhe president for the usa dress casual when visiting disaster zone someone need to educate our representative about dress code constitiuent dont wanna see representative in 4 piece suit in a time of crisis. Sounds just like our Deputy Premier. Mr. Hubert needs to condem wrong. He does not have to have access to funds to make a difference. Sharon Flax-Brutus has led tourism with passion and commitment, she's a hard worker, this season was due to be the best season for many years.. Lets hear what Dr ONeal has done for Virgin Gorda both before and after the hurricane please? I agree but she and her sister should remember that they work for the Government and they should try to work along with the district rep on any pertinent issues that arises. 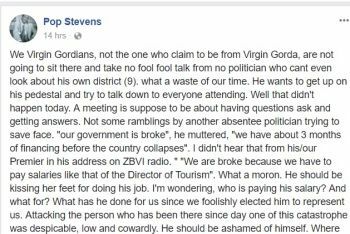 I am all for constructive criticism but this very public bashing of the government and district rep is not really helpful.